Zucchini has an uncanny ability to hide from sight. This is why I grow the costa romana zucchini. It doesn’t get mealy in texture when large. But I was obviously not doing my job when I found this one! 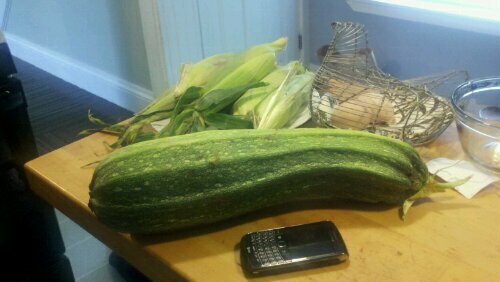 I took the picture with Deron’s blackberry next to it so you could get an idea of just how big this zucchini was. I did what any person would do. I sat down and started grating. I knew it froze nicely grated. I like to keep it in packages of 3 cups as that is how much the zucchini bread recipe I use takes. After an hour of grating, I was finally finished with task. I set aside two cups for a zucchini ginger cupcake recipe I found on epicurious, and froze two bags of three cups and one bag of 2 cups. Wait, I’ll do the math for you. That made 10 cups grated zucchini from just one. Guess I need to poke around a bit more from now on!